Austin Braddock to college - Training Day Fitness, Inc.
My name is Austin Braddock. I am a wrestler, class of 2012 at SVHS, and am a wrestler at Fresno City college. I first started working out with Scott while I was in High school with a goal to become an all around stronger and fine tuned athlete and wrestler. When I first started working out with him, Training day Fitness was still in an up an coming business. Scott and I were at the park 3 times a week training. Coming into these workout sessions I thought I was a pretty well rounded athlete, until Scott had me do a few balance and core work outs. Over the next few weeks I slowly started to see changes in my performance. Scott and I worked for the next few weeks till my high school wrestling season started. I felt confident in the hard work I put in with him after finishing the workout sessions. I started that wrestling season feeling ahead of other people on the team. As the season progressed i could tell the difference in my wrestling matches. 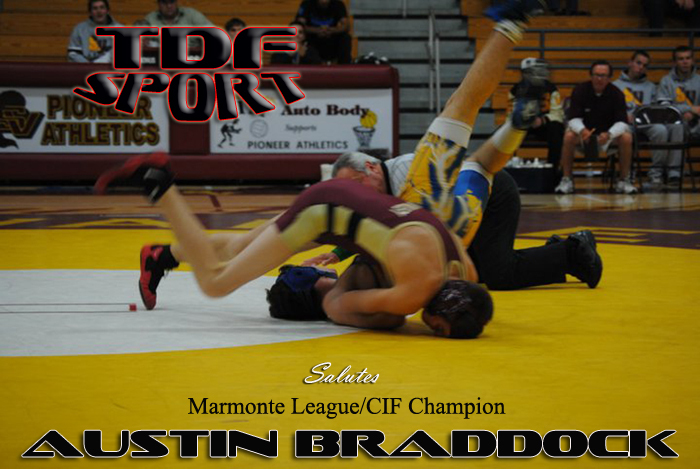 At the end of that wrestling season when the Marmonte league finals came around I took second place advancing onto the C.I.F. wrestling tournament. That tournament I walked away with a first place medal. After that season I continued to workout with Scott. My senior year was next. That year I won the league finals and took second at the C.I.F. wrestling tournament. The extra work i had put in with Scott had given me excellent outcomes. Training with Scott and Training Day Fitness changed my high school wrestling career. As an athlete I transformed. The results speak for themselves. TDF is the real deal. I continue to workout with TDF and get better each time. For the best results i recommend working with TDF over any chain gym, cross-fit, or boot camp in the local area.